EDITD’s mission – EDITD’s overall mission is to “help the world’s apparel retailers, brands, and suppliers deliver the right products at the right price and the right time”. Given the fast pace nature of the fashion industry decisions about product planning and the right amount of stock are absolutely critical. Julia Fowler, co-founder of EDITD, gives a good example when she explains that “today, an EDITD user can simply run a query on cardigans, for example, and receive results in under a second. More than 50 million SKU (Stock Keeping Units, MA) are tracked by the system.” I came across another good example in EDITD’s UK lingerie market retail calendar which aggregated data on new arrivals, discounts and sellouts can help merchandisers planning timing and location of their stock (see Fig. 1 below). It also helps navigate promotional activity and discounting. EDITD’s product – It was interesting to see what kind of features are included in EDITD’s product offering (see Fig. 2). I read in article in Fortune that EDITD’s dataset includes 53 billion data points on the fashion industry dating back more than 4 years. The Fortune article also mentioned that EDITD’s data covers more than 1,000 retailers across the globe. The way in which EDITD aggregates all this data through its different features (see Fig. 2) is where the main value of using EDITD’s services comes into play. Tangible benefits – Earlier this year, fashion retailer Asos said that using EDITD led to a 37% revenue increase in the last quarter of 2013. This was due to the data insights provided by EDITD which helped structure Asos’ pricing competitively. Geoff Watts, EDITD’s CEO, told The Guardian that the main value for Asos from using EDITD came from using their insights to make informed buying decisions grounded in data. “Retail on a basic level is all about buying the right things, so getting that right and making sure you’re selling the right product at the right price is really what dictates your success,” Watts said. Maria Hollins, Asos’ retail director, echoed this and stressed the importance of Asos making the right decisions faster than their competitors.“At ASOS, being first for fashion means being always competitive and having just the right assortment,” she said. “We’re using Editd every day to help us make critical buying and trading decisions”. If anything, EDITD saves retailers and brands from having to do so-called “comp shopping”, having to spend time going to competitor sites and stores to buy their products and compare prices. Instead, through EDITD, people can see at a glance what the competitive price points are (see Fig. 4 below). Main learning point: I can see why brands and retailers are keen to use EDIT’s data tools and insights on a daily basis. The data on fashion and apparel has been aggregated and presented in such way that it accommodates fast decision making. I was particularly impressed with what I’ve seen of EDITD’s front-end dashboard and the way in which its purpose built product tracker provides real-time market visibility. 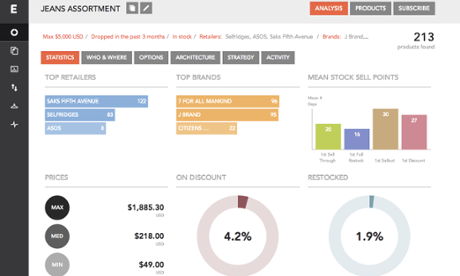 Market Analytics – EDITD offers a product tracker built specifically for the fashion and apparel industry. The tool provides real-time market visibility, analysis of new stock and discount activity, entry and exit prices and number of options in stock which enables retailers to benchmark their performance against each brand or retailer, providing insights into market positioning. Retail Reporting – EDITD offers daily and week reports on what’s selling the fastest and the latest trends in new arrivals. Visual Merchandising – EDITD has an archive of newsletters, blogs and webpages with real-time updates for brands and retailers across the whole market, worldwide. The idea is that every communication with customers is captured, to help users find discount cycles, product trends and themes, and understand their retail cadence. 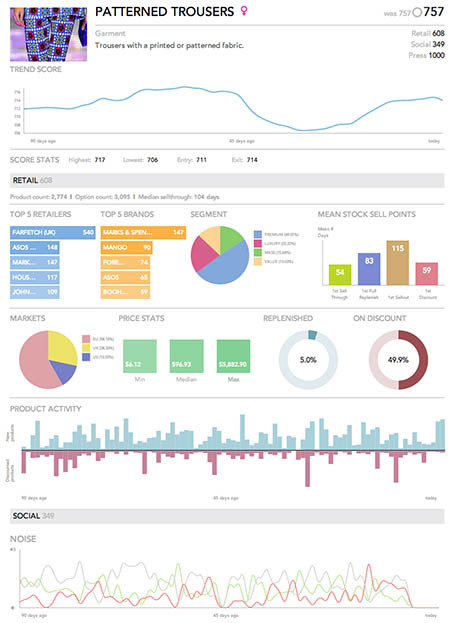 Trend Dashboard – EDITD’s real-time tracking monitors trend progress, and historic data shows performance and trajectory. This data is all captured in EDITD’s Trend Dashboard (see Fig. 3 below). Runway & Street – If you want to get a better sense of emerging trends straight from runway shows or the ‘streets’, EDITD provides visual reports on new fashion and apparel trends to look out for. Social Monitor – EDITD has a Social Monitor which combines the knowledge of over 800,000 thought-leaders, key influencers and fashion experts providing an instant source of inspiration and insight into the hottest trends and opinions.